DeKalb County junior and senior baseball players get one last game in 2017 as the DCSD All-Star Junior and Senior Baseball Classics are set at Redan High School on Tuesday, May 30. The ninth annual Junior All-Star Classic is set for a 4:00 pm start with the West holding a 3-1 lead in the series after back-to-back wins in 2015 and 2016. 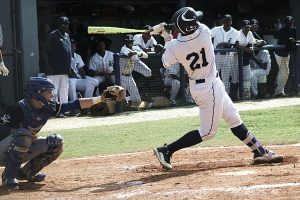 The East squad coached by Redan’s Alexander Wyche and Southwest DeKalb’s Tyrus Taylor has a lineup consisting of eight players who drove in 26 or more runs with their bats this spring. Arabia Mountain’s Corey King has a DeKalb leading 41 RBI on the season and hit at a .516 clip to be third on the DeKalb County list along with 13 doubles (tied for 2nd) to head up the run producing group of East team members. Tucker’s Trevon Flowers (.394 batting average) sits at 39 RBI in second behind King on the season. Arabia Mountain’s Josh Campbell (.477), Redan’s Orlando Adams (.393) and Redan’s Kelvin Smith (.433) all have 31 RBI on the season. Redan’s Taj Bradley (.441) has 28 RBI while Arabia Mountain’s Silas Butler (.396) and Tucker’s Stanford Flowers (.308) both have 26 RBI. King is the top pitcher on the squad with a 6-0 record and a 1.32 earned run average good for second in the county along with 51 strikeouts against just nine walks. Bradley is 3-2 with a 1.55 ERA and Arabia Mountain’s Jalyn Hawkins is 2-2 with a 2:02 ERA to go with 33 K’s on the season. West coaches Brian Ely of Chamblee and Donnie Hayes of Lakeside has the Columbia duo of Kameron Marshall (.394) with 37 RBI and Elijah Hammonds (.480) with 28 RBI. Towers Terry Dennis brings a .518 batting average to the plate for the West while Druid Hills’ Joseph Hiley (.419) knocked in 25 runs this season. The West pitching staff is led by Chamblee’s David Albuquerque (3-1, 2.42 ERA, 30 K’s), Dunwoody’s Josh Hudgins (2-5, 2.24 ERA, 33 K’s) and Lakeside’s Matthew Holt (3-1, 3.00 ERA, 31 K’s). The 15th annual Senior All-Star Classic is set for a 7:00 pm first pitch with the East-West series tied at 2-2 behind the West’s 8-2 win a year ago. Tucker’s Vince Byams and Arabia Mountain’s Eric Hoxie lead an East squad that brings a lot of All-Star experience with four players that excelled in the Junior Classic last year. Southwest DeKalb’s Javeon Cody comes into the game after leading the county in hitting at a .569 clip. Cody went 3-5 with a stolen base in the Junior Classic last year. Miller Grove’s Daniel Harris was 2-5 with a double and 3 RBI a year ago while Arabia Mountain’s Aaron Douglas was 2-5 in last year’s Junior game. Arabia Mountain’s Chris Sims set a record of being hit twice by the pitcher last year. West coaches Steve Dennis of Columbia and Robby Gilbert of Decatur have some experienced All-Star players of their own with three having played in the Junior game last year. Decatur’s Alex Glier was almost named the Junior MVP a year ago due to his 2-3 performance with 2 doubles, 2 walks and 2 RBI. Druid Hills’ Harrison Aiken was the winning pitcher for the West Juniors last year pitching the final four innings and was 7-4 with a 1.93 ERA this season with 45 strikeouts in leading the Red Devils into the Class 4A state playoffs. Cedar Grove’s Jenard Morris was 2-5 in the Junior game last year with a triple, RBI and a stolen base. He hit .484 this season with 6 doubles and 26 RBI.